The beach of Agalou Lakka on the island of Alonissos in Greece, information and pictures. Agalou Lakka Beach is located in the northwest of Alonissos and is the last beach accessible by car via an unpaved road. A good SUV car is recommended, because on some parts of the journey the road is not very good. Agalou Lakka Beach lies in the area that is considered the most beautiful piece of nature on the island, just like the beaches of Megali Ammos and Agioi Anargyroi. Here in this part of Alonissos island it is unspoilt and very quiet. Opposite Agalou Lakka Beach there is a small island in the sea. Agalou Lakka Beach is a small pebble beach and because it is so remote, there are no facilities. You'll have to bring your own water and some food if you want to sunbathe here. As I understand you have to climb over a fence and walk through a field to get there. 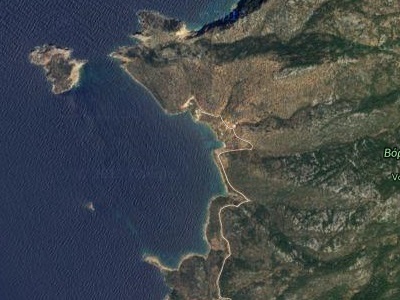 It seems to me that because it is so isolated this is also an excellent beach for naturists.